Sometimes seeing is believing, as was the case with students in urban education assistant professor Colin Dalton's READ 3305 Foundations of Literacy class. Students participated in a literacy development exercise at the UHD Community Garden last week, which involved connecting the setting and themes in Paul Fleischman's children's novel Seedfolks with the students' prior knowledge of urban environments, diverse neighborhoods and community gardens. The novel describes an ethnically diverse community in urban Cleveland that bonds while transforming a vacant lot into a vibrant community garden. According to Dalton, after reading the book and visiting the garden, students participated in a lively discussion on food production, freshwater issues, conservation and immigrant communities. Students also expressed an enthusiasm for teaching the novel, utilizing field trips to build schema and starting a community garden at their future schools. 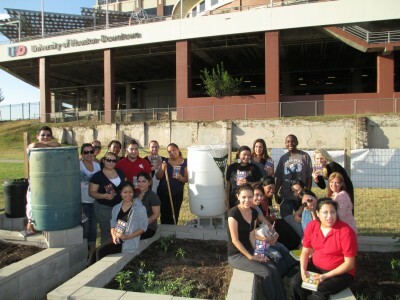 The urban education class poses with Seedfolks in the UHD Community Garden.